Specificité Recognizes GRIP 1 and GRIP 2. Immunogène Recombinant protein of rat GRIP (6th PDZ domain, aa 662-769). Conseil sur la manipulation Crude antisera are more robust than monoclonals. With anti-microbials added, they may be stored at 4 °C. 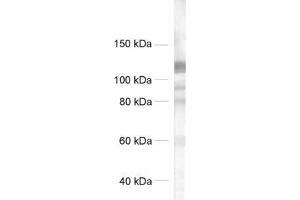 Stockage commentaire Unlabeled antibodies are stable in this form without loss of quality at ambient temperatures for several weeks or even months. They can be stored at 4 °C for several years.